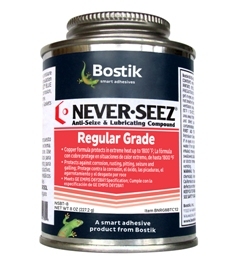 The "original" anti-seize compound and extreme pressure lubricant formulated with copper, graphite, aluminum and other ingredients to protect metal parts against rust, corrosion and seizure up to 1800ºF. Fine metallic and graphite particles in special grease protect parts even in high heat, high pressure and corrosive environments. Ford ESE-M12A4-A, Garrett Engine Div. PCS5724, Pratt & Whitney PWA 360523-2 and tested to MIL-A-907.